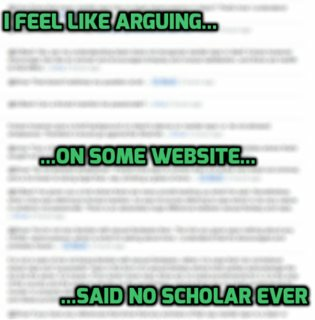 Despite the comment page specifically saying "comments are not recommended for... secondary discussion or debating a controversial point; please use chat instead" and despite multiple meta posts warning against how arguing in comments significantly harms the site (ashes999, 2012; Aarthi, 2012; Jon Ericson ♦, 2014; Shog9 ♦, 2014; goldPseudo ♦, 2015), arguing in comments continues at Islam.SE. This post is yet another plea to stop arguing in comments, but this time aimed to be more constructive than "don't do that". Alternative 1: Ask a question. A third party may give a better answer again. Alternative 2: Give a better answer. If you disagree with an answer, why not give a better one? You may learn something on top of your current knowledge about a topic. Alternative 3: Downvote; vote to close; vote to delete; upvote better posts. If it's a poor answer, downvote it, and vote to delete, and upvote better posts. This uses the site how it was designed to be used. It works! Alternative 4: Let someone else help. Is your criticism more about proving you are right or making someone look foolish than helping others improve their posts? Let someone else help. Are you incapable of talking politely? Let someone else help. Alternative 5: Don't worry about it. You already know your own criticisms. How useful is your criticism to someone other than you? If it doesn't have some tangible benefit, then it's noise and not worth posting. Is the post on-topic, yet obvious rubbish? We can assume others will come to the same conclusion if they see it. We don't need to draw attention to it; let it remain insignificant and ignored. Does an answer have a much lower score than another answer? The community has already commented on the quality of the post. It is possible (and generally encouraged) to edit other users' questions and answers. Doing things like adding reliable references and fixing spelling/grammar errors are usually unproblematic. It's generally good to edit questions in order to better highlight the question in the post, add/remove appropriate tags, and remove material which is not required to answer the question. I find it best to stick to minor, obvious edits when editing answers, because things can easily turn ugly otherwise. Edits may be reverted, in which case it's best to leave it alone afterwards, in order to avoid an edit war. Alternative 7: Wait until later to comment. Personally, I like to go for a run. Alternative 8: Take it to chat. Chat is designed to offload the noisy comment chit chat. Alternative 9: Attract new users to the site. upvoting worthy content, thereby rewarding positive contributions. In this way, over time, these new users will ask better questions and improve the community's collective knowledge. Over time, comment squabbles will become insignificant. Alternative 10: Lead by example. Spending time to improve the quality of your questions and answers. In short, by using the site how it's intended to be used. Alternative 11: Upvote the user's better posts instead. Through upvoting (positive feedback), make users come to the realization: if I [add references] to my post, I get more upvotes. Alternative 12: Take it to meta. A post seems problematic for some kind of "global" reason (e.g., maybe this kind of post is off-topic). Maybe you think a post is problematic, but want to gauge the community's attitude to see if your opinion is typical. We need an active meta, just like we need an active an active main site. Please keep it polite, as always. And if possible, it's better not to "name and shame" an individual (so the meta post have long-term value, rather than once-off usefulness). Alternative 13: Become an Islamic scholar yourself. This might seem far fetched at first, but e.g. on math.SE a lot of the users there were originally university students, PhD candidates, and the like, and over time they ended up becoming experts themselves. It can happen. And give lots of incrementally better answers along the way! Alternative 1: Don't feed the trolls. Am I being baited into an argument? Will they, no matter what I reply, simply throw mud back? Are they even interested in a response? Or are they interested in "winning" an argument (even at the expense of the site)? Let's not reward their misbehaviour. Ignore them. They thrive on wasting your time. Are you responding to "save face" in response to a rude or patronising comment? Flag their comment instead. StackExchange is designed to give the users of the site the power to self-moderate. Do it! Alternative 3: Take it to chat. Alternative 4: Take it to meta. polite; as always Be Nice, and try to convey the content without being snarky, patronising, etc. If the author responds to your (well-formed) criticism, please accept a difference of opinion and refrain from continuing (unless there is some meaningful benefit to the site; not just because someone on the internet is wrong [xkcd]). A third party can read the criticism and make up their own mind; a valid point doesn't need to be force-fed to others. A meta.SE post How do comments work? gives details as to what comments are about on the StackExchange network. What's so bad about arguing in comments? Eliminating the noise and focusing on high-quality questions and answers has always been the StackExchange model. The users who repeatedly argue in comments (thereby making the site unattractive to experts) curiously justify their comments by asserting they improve the quality of the site. Browse other questions tagged discussion etiquette comments . should comment be deleted silently with no notify of the reason? Were these comments deleted inappropriately? Did you know you can ignore tags? Should we (slowly) flag the “bot friendly site” comments as “no longer needed”?